This year we’ve got Christmas all wrapped up with our Grand Christmas Raffle! We’ll be revealing the details of the Christmas Fair, taking place on Friday 4th December, shortly but one thing you won’t want to miss is a chance to bag one (or more!) of the amazing raffle prizes on offer. 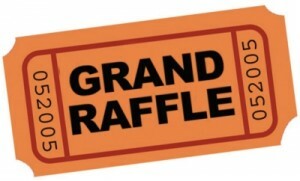 Each child will be bringing home one book of raffle tickets to sell - so be sure to snap them up quickly, or sell to family and friends, at only 50p per ticket or £2 per book. The PTA will also be selling extra tickets in the lead up to the Fair on the school playground and at the Christmas Fair itself on Friday 4th December – so there’s plenty of opportunity to beat the odds and be in with a chance of winning. The big prize draw will be made on the night of the Christmas Fair – just another reason to come along! Below are the sensational prizes on offer! Sweet Thoughts – Golden Ticket! Many thanks to all the businesses for their generous donations.